One whole year has passed since Let it Die was released by GungHo Entertainment and Grasshopper Manufacture for the PlayStation 4. Due to it being free-to-play, Let it Die quickly amassed a dedicated following of players looking to make their way to the very top of the Tower of Barbs. 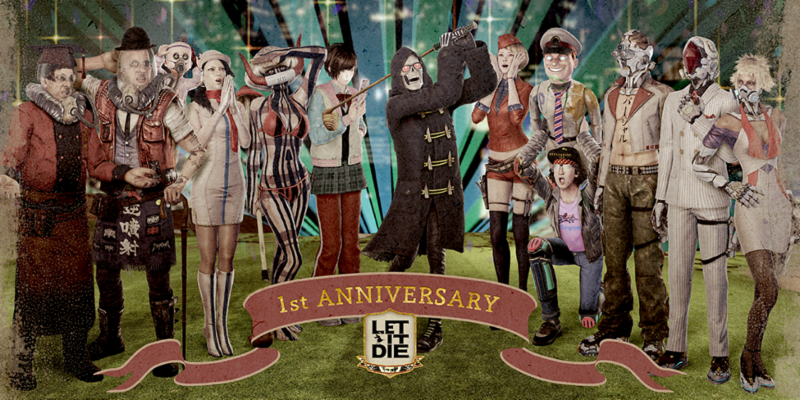 Whether you’ve been able to reach the pinnacle of Let it Die success or not, you’ll definitely want to experience the game’s upcoming anniversary celebration. Kicking off this Thursday, November 30th, and ending on Thursday, January 11th, the Let it Die anniversary celebration includes a little help from Wargaming’s free-to-play hit, World of Tanks. Tiger II: Fire a WAR ENSEMBLE weapon for five seconds, which reloads with explosive rounds that deal 20% more damage. STEEL WALL: 20% chance of not taking any damage when hit. Chi-Ha: After using a WAR ENSEMBLE weapon for five seconds, ammo changes to explosive rounds that deal 30% more damage. SHARPSHOOTER: Reduced bullet spray and recoil when using a WAR ENSEMBLE weapon. PATROL DUTY: Shows enemies on the map permanently and decreases Dash stamina consumption and Fatigue Time by 50%. BILLOTTE’S MEDAL: Players recover faster from being set on fire or from paralysis when electrocuted. T95E2: Increases attack power during Down Attack by 50%. Call for Vengeance: Rage Gauge increases by +2 when starting a Raid from the Revenge List. INVADER: Increases attack by 20% in a Raid. Unique collab armor will also be available for purchase in the PlayStation Store during Let it Die’s anniversary event. This armor is based around the T-34/76 tank found in World of Tanks, and overall it looks pretty awesome (even for those who have little experience with World of Tanks). Furthermore, you’ll find special decorations strung up in the Waiting Room alongside new limited Theme Quests and Special Equipment for players brave enough to take on WARDOGS in the Tower of Barbs. As a reward for players who log in between December 21st and January 11th, a limited edition pair of Uncle Death’s Space FunGlasses will be given out. Not only are they cool to equip on your Fighter, but they also increase the wearer’s defense and stamina. So, be sure to log in to Let it Die starting this Thursday, November 30th to take advantage of all the goodies available during the game’s 1-year anniversary event!